Based on the super-composite effect of clay minerals consisting of silicate layers on the polymer, nano-hybrid organic–inorganic composites have attracted great interest. In this paper, a novel organoclay with reactive hydroxyl group was prepared by incorporation into a hydroxyl-terminated cationic polyurethane oligomer (HTCPU) via interlamination. Sodium montmorillonite was organically modified with HTCPU oligomers in the water medium. The modified organo-montmorillonite was characterized by Fourier-transform infrared spectroscopy (FTIR), X-ray diffraction, and thermogravimetric analysis. After sequential poly-addition reactions, the hydroxyl-terminated polyurethane hybrid resins with nano-silica layers were prepared and then the resin mixed with blocked hexamethylene diisocyanate trimer (crosslinking agent) in advance and then was emulsified with deionized water to produce the nano-hybrid electrophoresis coating. A series of PU films were prepared by the electrophoresis process. The optimized baking temperature was determined by in situ FTIR, and the effect of the organo-montmorillonite content on the acid resistance of film was studied. When the mass fraction of organo-montmorillonite was about 0.35%, the PU film showed the best acid resistance. 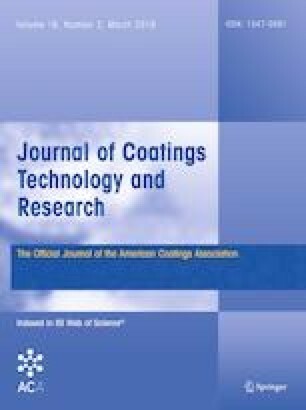 It was found that the desirable appearance and properties could be obtained by a prebake of a temperature of 80°C to remove water in the wet film to avoid the pinholes in the paint film for 20 min, followed by a baking temperature of 135°C for 60 min. This work was supported by National Natural Science Foundation of China (No. 21676150, 21176126) and Shandong Key Research and Development Project (2018GGX102018).